Donald Young reached the third round at the 2014 Australian Open, earning his first live action in a Davis Cup tie. MELBOURNE, Australia – It has been nine full years since Donald Young became the youngest male to win the Australian Open juniors, at age 15 years, six months, and the youngest player ever to reach No. 1 in the ITF junior rankings. Back then, he was considered a surefire prospect. How far he would rise in the rankings was up to debate, but every analyst who was asked thought he would have a long pro career if he was healthy. As it turns out, they were right, but the extent of their predictions might not have been spot on. "He has a winning way about him," coach Eliot Teltscher said about him in 2005. "It would be hard to believe that he won't make it as a pro. He moves very well and has beautiful strokes. He really knows his way around the court." Young showed off those positive qualities in the second round of the 2014 Australian Open, taking down 24th seed Andreas Seppi, 6-4, 2-6, 6-3, 4-6, 7-5, in sweltering conditions. The two went off the court for four hours after the fourth set, as temperatures had reached 110 degrees and the tournament’s Extreme Heat Policy had gone into effect. It was a good thing for Young, who admitted that he was dizzy and needed a break. Serving at 5-4 in the fifth set, the left-hander grew nervous, played sloppy and was broken at love. But he quickly shook that off, attacked the next game with his heavy forehand and broke the Italian when he won an amazing defensive point, punching back one big shot after another until he forced Seppi into an error. He then held for the win and delivered a windmill fist pump of joy. The two victories in Australia marked the first time he has advanced to the third round of a major since the 2011 US Open, when he stunned No. 14 Stan Wawrinka in five sets and No. 24 Juan-Ignacio Chela before losing to Andy Murray in the fourth round. Young peaked at No. 38 in the world in early 2012. 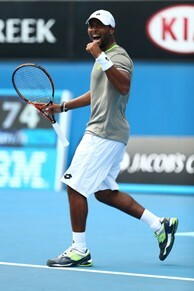 Following the 2011 US Open, Young reached his first-ever ATP final at the Thailand Open, where he upset Gael Monfils. He also qualified and reached the second round of the ATP Masters 1000 event in Shanghai and ended the season ranked a career-high No. 39. But he made the mistake of changing racquets and struggled in 2012, going 5-24 in ATP matches on the year. He rebounded in 2013, winning 10 qualifying matches in one six-week stretch and returning to the Challenger circuit to rebuild his game and his confidence. He won a Challenger title in Mexico in April, and at the US Open, he scored a win at the ATP level again, qualifying and taking out Martin Klizan before losing to Florian Mayer in the second round. From there, Young was off to the races, winning 12 straight Challenger matches, including titles at Napa and Sacramento. At year’s end, he had cracked the Top 100 again. “Winning those two Challengers at the end of the year was pretty big,” he said. Young said he had a good off-season, often training at the USTA Training Center-West in Carson Calif., and it showed in his preparations for Melbourne. Two weeks ago, he qualified for Auckland, won a match and played world No. 3 David Ferrer close in a three-set loss. Through all the ups and downs, the 24-year-old said he has gained some perspective on his career. Young faces Japan’s Kei Nishikori in the third round, whom he knows from the juniors. He realizes he will be the underdog against the 16th seed but thinks he has a chance to pull off an upset. Whether he does so or not, he said he’s happy with the place he’s in. “I’m just playing for myself and to prove some things to myself and just to make me happy, not anybody else,” he said.